Remember M.I.A. 's "Bad Girls" clip? It's the one that pretty much set the music-video standard for 2012 and depicted Saudi Arabian women driving. In burqas and all, they scorched through the desert sands to their hearts' delight. It was an exhilarating middle finger to the country's sexist driving laws and instantly achieved water-cooler status around the world. Now that assertive fantasy is playing out in reality, and so far it seems women are getting away with it. On Saturday, 60 female drivers reportedly took to the road in protest of Saudi Arabia's stringent laws — and faced little police protest. The ongoing driving conflict stems from the kingdom's demanding interpretation of a strict branch of Islam, Wahhabism. 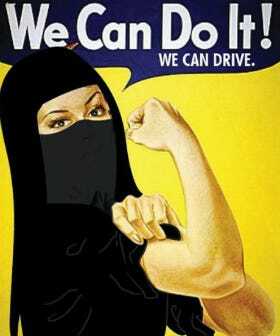 The most conservative Muslim academics claim that allowing women to drive could unravel Islam civilization and, apparently, "damage women's ovaries!" (Now you can see why M.I.A. was so tempted to toy with this draconian ideal.) The catch is there's no specific law outright banning women from driving, but it won't allow them to get driver's licenses. These clever females, however, were licensed in other countries and were therefore, technically, free to do as they please.